To commemorate the upcoming holiday, (Oh you thought we meant Christmas? Our apologies) the Cyclones are offering 250 Festivus Ticket Packages for our Salute to Seinfeld Night on July 5, 2015. The package includes a field box ticket to the game and limited edition Cyclones "Man Hands" for just $30. The offer is valid only on Festivus - December 23rd starting at 10 AM. The Cyclones front office will be closed from Thursday, December 25th through Sunday, January 4th opening again with normal hours on Monday, January 5th. The entire Cyclones staff wishes you and your family a joyous Holiday season and a Happy New Year. On Sunday, December 21st, Santa will be making a stop at MCU Park to fuel up for his big day. Join the Cyclones, Sandy and Santa Claus for breakfast starting at 10:00 AM. Admission is just $10 a person and includes breakfast and a photo op with Santa. We will also be collecting new, unwrapped toys to distribute this holiday season as well. With the Holiday Season upon us, the Cyclones team store is your one stop destination for the perfect presents for all the Cyclones fans in your life. The store at MCU Park is open Tuesday - Saturday until Christmas, and features HUGE discounts on some of our most popular items. The Brooklyn Cyclones have been recognized for the franchise's outstanding 2014 season and longtime contribution to the baseball industry and local community by being named the winner of Baseball America's prestigious Bob Freitas Award for the Class-A Short-Season/Rookie level. The Arizona Fall League has long been a proving ground for the top prospects in professional baseball. This autumn, several former Brooklyn Cyclones - including L.J. Mazzilli and Brandon Nimmo - earned their keep in the desert. Juan Lagares, who played 19 games at third base and shortstop with the Cyclones in 2008, was honored with the 2014 Rawlings Gold Glove Award for all National League Centerfielders. He is the first former Brooklyn Cyclone to win a Gold Glove Award. Following the 2014 New York-Penn League season, the Jamestown franchise moved to Morgantown, WV. It has been announced that the new franchise, which will begin playing in a brand-new facility shared with the West Virginia University Mountaineers, will be called the Black Bears. The Brooklyn Cyclones were honored with a pair of "Golden Bobbleheads" at the 2014 Minor League Baseball Promotional Seminar. The awards, which are voted on by Minor League Executives from across the country, recognized the Cyclones for Best Theme Night and Best Overall Promotion for their Salute to Seinfeld Night on July 5th. AC Leonard finished the game with four catches for 108 yards, including a critical 49 yard catch that set up the winning field goal as Nick Marsh drilled a 36-yard attempt to give the Bolts a 15-13 win over the Omaha Mammoths. The Brooklyn Bolts will wrap up their Inaugural Season on Friday, November 7th against the Blacktips. The first 1,000 fans in attendance will go home with one of these Bolts jerseys. Get your tickets now. The Brooklyn Bolts will celebrate Oktoberfest at MCU Park during their game on Friday, October 24th against the Omaha Mammoths. Enjoy all the action on the gridiron while also enjoying the music, food and - of course - drinks that are associated with Oktoberfest. On Tuesday, October 14th the Brooklyn Bolts will officially be welcomed to their home borough during a ceremony on the steps of Brooklyn Borough Hall at 2:00. Fans are encouraged to stop by early, starting at 12:45 as Bolts players and coaches will be on hand signing autographs and posing for photos with fans. Football is the ultimate team sport on the field, but when you watch from the stands with a team of your own, it's even better! Groups of 15 or more will receive a Brooklyn Bolts cap for everyone in their party. Experience the fun and excitement of Brooklyn Bolts football, coming to Coney Island this fall. The Brooklyn Bolts will kick off their first season in franchise history on Wednesday, October 15th when they take on the Boston Brawlers. The Bolts will also kick off the month of October with a Breast Cancer Awareness Day presented by The Maimonides Breast Center where the first 1,000 fans in attendance will go home with a special Brooklyn Bolts Pink T-Shirt as the team paints the park pink. The roster for the Inaugural Season of Brooklyn Bolts football has started to take shape as training camp opens in Coral Springs, FL. The team features players from football factories like Notre Dame, Auburn, Georgia, Florida and Tennessee. The Brooklyn Bolts and the FXFL are bringing professional football back to New York City for the first time in over thirty years. The team's Inaugural Season kicks off on October 15th with tickets starting at just $20! Bring the thunder to MCU Park this fall. With the Brooklyn Bolts set to kick off their Inaugural Season in the FXFL on October 8th, the team has announced the promotional schedule for their 2014 home schedule - which gets under way on Wednesday, October 15th against the Boston Brawlers. The FXFL has announced the coaching staffs for the league's Inaugural Season, and former New York Jet and Miami Dolphin John Bock will be the head coach for the Brooklyn Bolts. Joining him on the coaching staff will be former All-American linebacker and 10-year NFL veteran Marvin Jones who spent his entire playing career as a member of Gang Green. First, the Brooklyn Cyclones brought professional sports back to the borough for the first time in over 40 years. Now MCU Park will once again play host to a historic moment in Brooklyn sports history as the Brooklyn Bolts, a member of the newly formed FXFL, kick off their Inaugural Season this October. Coming into the season finale, Brooklyn needed a victory - which they got thanks to a 3-1 win over Staten Island - but the Connecticut Tigers held on by the skin of their teeth for a 9-8 win over the Lowell Spinners to officially put an end to the Cyclones season. Connecticut and Brooklyn finish the season with the same record, but the Tigers win the tie-breaker. The Cyclones came up just short of a berth in the 2014 NYPL Playoffs. All tickets purchased online will be automatically refunded for the price of the tickets, fees will not be refunded. Tickets purchased at the ballpark must be returned to the ticket office by October 10 to be refunded. Sunday, August 31st is the final regular season home game of the 2014 Brooklyn Cyclones season. Where did the summer go? But once again the 'Clones will lead the NYPL in attendance and are on the verge of claiming the final spot in the New York-Penn League Playoffs. Come join us as we say thanks to the over 230,000 fans that will come through the gates of MCU Park this summer. On Wednesday, August 27th the Brooklyn Cyclones and Staten Island Yankees will square off at MCU Park on 90s Night at the ballpark. As part of the evening's festivities, the Cyclones will be wearing special Nickeldeon "90s Are All That" jerseys that will be raffled off throughout the game with all proceeds to benefit the ALS Association. To kick things off, the Cyclones front office had their own twist on the "Ice Bucket Challenege" with the Slime Bucket Challenge thanks to our friends at Nickelodeon. Join the Brooklyn Cyclones Beach Bums on Sunday, August 31st for the annual Beach Bum Summer Dance Clinic. Kids will learn routines throughout the day and then perform them on the field prior to the Cyclones game against the Staten Island Yankees that evening. On your mark, get set, go! Break out your Starter jackets, frost your tips, and put on your Doc Martens because the ‘90s are back in Brooklyn for one night only—and they’re All That! On Wednesday, August 27, 2014, The Brooklyn Cyclones and Nickelodeon are joining forces to bring you The ‘90s Are All That Night, when the Cyclones take on the Staten Island Yankees at 7 p.m. Kel Mitchell, star of iconic Nickelodeon ‘90s shows All That and Kenan & Kel, will throw out the first pitch. As the end of summer nears, so do the days of summer baseball. The major league teams still have about two months left, but with the start of school around the corner, now is the time when little league baseball teams are competing to go to the 'ship. Although it's been about ten years since some of the Cyclone players have played their glory days at their hometown parks, they still carry fond memories of little league with them as they progress on their baseball careers. The Brooklyn Cyclones cordially invite all of the Princesses from throughout the kingdom to assemble at MCU Park on Saturday, August 23rd for a royal evening at the ballpark featuring tiara's, red carpet treatment and daddy/daughter dancing on the field. Sunday is FUN day at MCU Park. Head to Coney Island on August 24th when the Cyclones take on the Tri-City ValleyCats at 5:00 PM. The first 2,500 fans in attendance will receive a retro baseball card sheet featuring the Cyclones All-Stars courtesy of the Daily News. PLUS, arrive early for your chance to have a catch on the field prior to first pitch, and stick around after the game for kids run the bases. It's a fun filled day from start to finish! On Friday, August 22nd the Brooklyn Cyclones will hold their first-ever Brooklyn Beach Party featuring the ladies of Sports Illustrated's Swimsuite Issue. An array of models will be on hand including 2014 cover model Lily Aldridge, Hannah Davis, Hannah Ferguson, Gigi Hadid, Chanel Iman, Ariel Meredith, Jess Perez and Adaora Abubilo. The ladies of SI's Swimsuit 2014 will participate in beach themed contests in game and have photo ops with Military Members as well as the general public. Last call! Thursday, August 21st is the last Jersday Thursday of the season and some may say that the we saved the best for last. New York Mets pitcher Daisuke Matsuzaka will make the start on Thursday for the Brooklyn Cyclones as part of his Major League Rehabilitation Assignment. It's a Jersday Thursday at MCU Park when the Cyclones take on the Staten Island Yankees at 7:00 PM. On Tuesday night, the New York-Penn League will induct thier third class into the NYPL Hall of Fame as part of the 10th Annual New York-Penn League All-Star Game to be played at MCU Park in Brooklyn. This year's inductees include John Elway, Randy Johnson and Charlie Wride. On Tuesday, August 19th, MCU Park will host the best and brightest that the New York-Penn League has to offer at the 10th Annual NYPL All-Star Game presented by the Tic Toc Stop Foundation and Mercedes Benz of Brooklyn. Tickets for the game, which start at just $10, are currently available at the MCU Park Box Office, by calling 718-507-TIXX, or right here at BC.com. The high-flying, hard-nosed, innovative wrestling that is Ring of Honor, will be heading to MCU Park on Friday, August 15th for their first-ever show on Coney Island. Tickets are on sale now! The Cyclones newest outfielder, John Mora had an impressive week that earned him this week’s National Honey Board Player of the Week. For the first time since 2005, MCU Park is hosting the New York-Penn League All-Star Game. With some of the baseball’s future stars making their way to Coney Island for this year’s game, we take a look at who will be representing their teams in the 10th annual NYPL All-Star Game. On Thursday, August 14th the Cyclones will celebrate Brooklyn's favorite son: Gil Hodges prior to the team's 7:00 PM game. This year would have been Gil's 90th Birthday, and the team will remember the former Brooklyn Dodger slugger and New York Mets manager in a pre-game ceremony featuring members of his family. 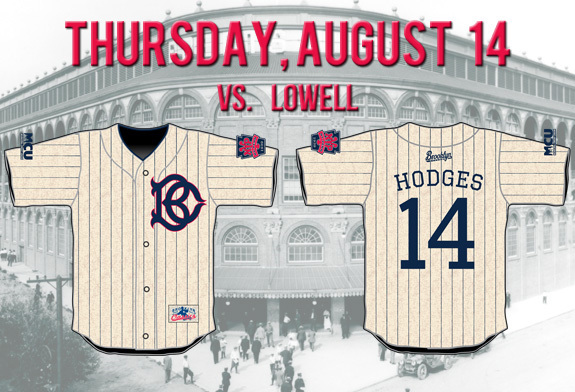 The first 3,000 fans in attendance will also receive a #14 Gil Hodges Jersey courtesy of MCU. Join us at MCU Park on Wednesday, August 13th as we collect food for City Harvest at the front gates of the ballpark. Fans are encouraged to bring a non-perishable food donation to the ballpark and will receive a raffle ticket in exchange for their donation. Those who donate will be eligible for prizes including signed items, $50 gift cards from MCU and more. Over the years, we've heard from fans that not everyone can make our weekend fireworks shows. Problem solved! 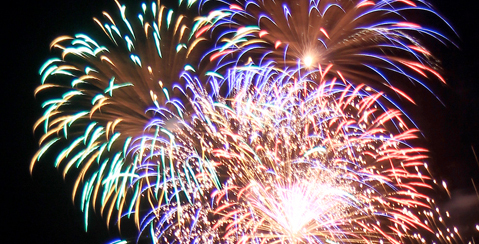 On Wednesday, August 13th the Cyclones will host a mid-week fireworks show. But that's not all. Every ticket in the ballpark is just $10 plus the first 2,500 fans can go home with one of our collectible All-Star Series Cups. The New York-Penn League All-Star Game presented by Tic Top Stop and Mercedes Benz of Brooklyn will be played at MCU Park on Tuesday, August 19th. While the best and brightest from around the league descend on Brooklyn, the Cyclones will be well represented with six all-stars. Baseball is always better with your buddies, so why should man's best friend be left out? Head to MCU Park on Tuesday, August 12th for Bark in the Park presented by Unleashed by PETCO. If you are coming to the Mad Decent Block Party at MCU Park on Saturday, August 9th, here's a guide to everything you need to know about the rules and regulations for this event. Michael Conforto has been a force to be reckoned with since joining the Cyclones in mid-July. Clutch hits, mammoth home runs, gunning down runners at the plate...the guy can do it all. But here's your chance to find out a bit more about one of the most impressive players to ever suit up for the Cyclones. Kermit, Miss Piggy, Fozzie, Gonzo and the rest of the gang will be heading to MCU Park on Monday, August 4th as the Muppets Take Coney Island. The entire evening is made possible by Disney's "Muppets Most Wanted" coming to Blue Ray Combo Pack and Digital HD on August 12th. On Monday, August 4th the Cyclones will celebrate Bay Ridge Night presented by Bay Ridge Cares. There are still great opportunities for your group or business to get involved. On Tuesday, August 5th join the Cyclones for their annual Charity Golf Outing at Dyker Beach Golf Course. This year, the team has also added a casino night to the festivities. To sign up contact Josh Mevorach at 718-382-2603. The Cyclones and the Connecticut Tigers faced off Sunday evening for the second game of an important three-game series. The Cyclones and Tigers entered the game tied for first in the New York-Penn League wild card race, but a good offensive performance from the Tigers would give them lone possession of first. On Sunday, the Cyclones will celebrate the foundation of baseball...The Sandlot. Children who attend the game wearing their Little League Baseball or Softball Uniform will get a free ticket with the purchase of one adult ticket at regular price. Kids can also run the bases post-game and everyone is invited down to the field pre-game for a special photo session with players as part of Selfie Sunday. There is no better way to spend a summer day with the whole family, than to spend it at Sunday Funday at MCU Park. The fun will begin before Sunday evening’s 5PM game, when fans will have the opportunity to takes photos with players as a part of “Selfie Sunday," there will also be a special exhibition of old-time baseball as we Salute Sandlot Baseball. On Saturday, August 2nd, the Cyclones will hold Star Wars Night II at MCU Park, but the fun doesn't have to end after nine innings. With the Star Wars Sleepover package, you get a field box seat for the game, access to a special meet-and-greet with characters from the classic film, PLUS you'll be able to stay after the game for a family sleepover on the field at MCU Park and more! Back-to-school time may be creeping up on you, but it's not here yet. Enjoy a one last summer night with your buddies before heading back to campus. On Saturday, students can show their college ID and get a ticket in the bleachers for just $5. Plus stick around after the game and enjoy $2 draughts or soft drinks at Peggy O'Neill's when you show your Cyclones game ticket. On Friday only, we are waving all ticket fees when buying your seats through BrooklynCyclones.com. That means Star Wars Night, Muppets Night, Brooklyn Bridge Jersey Giveaway, the NYPL All-Star Game and more are available right now with ZERO add ons. The most affordable baseball in New York City, just got even better! Get your tickets now and keep that cash in your pocket later! 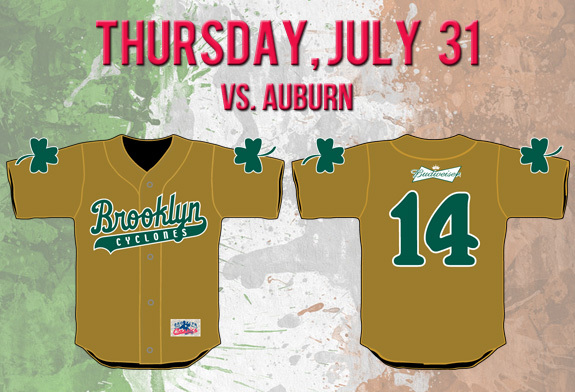 On Thursday, July 31st the Brooklyn Cyclones will host the Auburn Doubledays for Irish Night at MCU Park. The first 3,000 fans in attendance will receive one of these "Shamrock Jerseys" courtesy of Budweiser. Since 2001, the Brooklyn Cyclones have received a number of accolades for their community service, promotional excellence and innovative ways of making a trip to MCU Park unlike any other. But among all the titles that have been bestowed upon them – “Most Fun Ballpark in America” or “The Coolest Place on Earth” – there is one label that has been missing…until now! Kick off the Cyclones six game home stand on Wednesday, July 30th, when all tickets are just $10! This deal is quite the steal, I mean it's a really good deal...no need to get the police involved. Oh, nevermind. Saturday, July 26th will be filled with monkey business at MCU Park as everyone's favorite primate Curious George makes an appearance at the ballpark as part of WNET Family Day at MCU Park. Curious George and his partner in crime the Man with the Yellow Hat will be on the concourse during the game to take photos with fans in attendance. Trick-or-treat! It will be Halloween Night at MCU Park Saturday Night as the Cyclones wrap up a three game series against the Lake Monsters at 6 PM. Fans of all ages are encouraged to dress up in their favorite costumes and participate in trick-or-treating around the ballpark’s concourse. The park may be haunted with ghosts that night, but make sure to save the “Boos” for when the Lake Monsters are at bat. The Cyclones very own King Henry will be channeling his inner Elvis, as he rocks out to some of The Kings greatest hits. The first 2,500 fans in attendance will receive “The King” Henry Bobblehead when they enter the stadium. There will also be a few special guest appearances. Curious George and his partner in crime, the Man with the Yellow Hat will be going bananas on the concourse, taking pictures and meeting the fans who are in attendance as a part of WNET Family Day. Fans will not want to miss out on all of the fun happening Saturday at MCU Park. Tickets are still available by calling 718-507-TIXX, visiting the MCU Park Box Office, or logging into BrooklynCyclones.com. Forza Italia! On Friday, July 25th the Cyclones will celebrate Italian Heritage Night at MCU Park. The team will be wearing these special Italia Jerseys and caps that will be raffled off throughout the game. Be sure to stick around post-game for our Friday Night Fireworks spectacular. How can you not be romantic about baseball? Baseball has always had a special place in Brooklyn’s heart. 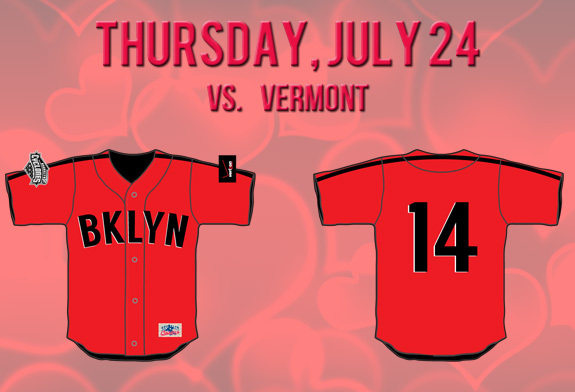 So, what better way to express this love than with an exclusive Brooklyn jersey? The Cyclones return home for a series against the Vermont Lake Monsters Thursday night at 7 PM with another special Jersday Thursday giveaway. This week's National Honey Board Player of the Week is Octavio Acosta, who tossed a season-high 8.0 innings on Saturday night as the righthander improved to 3-1 with a 1.46 ERA after snapping Brooklyn's eight-game losing streak. It's a bird (well, yeah), it's a plane, no...it's SUPER SANDY!!!! Come to MCU Park on Sunday, July 20th for Super Hero Night. All fans - big and small - are encouraged to head to the ballpark in costume to give the whole evening some superpowers. The first 2,500 fans in attendance will also receive a Super Hero Lunch Box courtesy of GEICO. YEE-HAW! Make sure to bring your boots, cowboy hats, and get ready to line dance, as the Cyclones celebrate Country Music Night at MCU Park, presented by 94.7 NASH FM, on Saturday July 19th. Stick around after the game for some post-game fireworks as well! On Friday, July 18th, the Cyclones will honor New York's Bravest on FDNY Appreciation Night at MCU Park. The team will be wearing special jerseys that will feature local Ladder / Engine Company Numbers on the sleeve. Game time is 7:00 PM and we are offering special discounted tickets for member of the FDNY. Who says hockey isn't a summer sport? 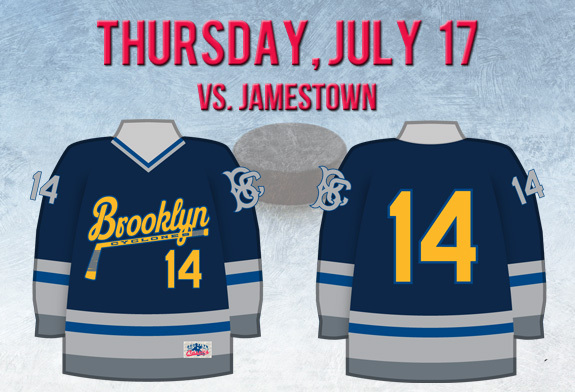 Head to MCU Park on Thursday, July 17th for our second Jersday Thursday of the season. The first 3,000 fans in attendance will go home with one of these Brooklyn Cyclones Hockey Jersreys courtesy of Domino's Pizza. In honor of his first All-Star Game appearance this evening, we will be honoring the former Cyclone with the Daniel Murphy Double Play ticket offer. You get a ticket to Irish Night (July 31st) and the NYPL All-Star Game (August 19th) to be played at MCU Park PLUS a Daniel Murphy Pot O'Gold Bobblehead for just $28. This week's National Honey Board Player of the Week is Michael Katz. The 9th round selection from the College of William and Mary hit safely in six of eight games including four multi hit contests. In 29 games this season, Katz is batting .286 (30-105) with 14 runs score,d seven doubles, one triple and 14 RBI for the Cyclones. On Saturday, July 12th, MCU Park will host the first-ever "Coney Island On Tap Beer Festival." Over 100 beers will be available from over 50 of the country's best craft breweries. In addition to the incredible selection of beer, there will be live music and delicious food available as well. Based on demand, a SECOND session has been added. Get your tickets now! Cyclones first baseman Jeff Diehl has been named the National Honey Board Player of the Week for the period ending July 7th. He currently has a 10-game hitting streak and is swinging the sweetest (get it, just like honey?) bat in the lineup. 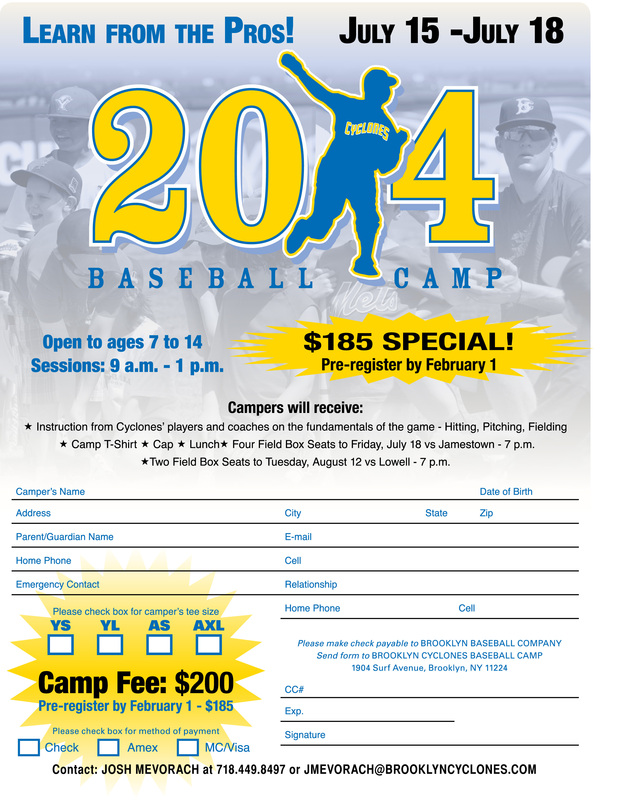 Head to the ballpark on Tuesday, July 8th for the first of two special Camp Days with a start time of 11:30 AM. Catch some fun and some foul balls when the Cyclones take on the Hudson Valley Renegades with tickets starting at just $10. For those who can't make both games, tickets will be just $1 starting at 2:00 PM that afternoon. How do you improve on a lightsaber battle for the ages and Darth Vader throwing out the first pitch? We found a way. Star Wars Night II will feature one-of-a-kind Sithclone Jerseys on the field and the first 2,500 fans in attendance will receive a Padawan Pee Wee Bobblehead. It's going to be out of this world! Prior to the start of every Monday and Wednesday home game during the 2014 season, fans can head to the all-new Wine Drives and Short Hops Sports Bar, located off the Main Lobby at MCU Park, for a mouthwatering Brooklyn Buffet for an hour before the scheduled first pitch for just $12. Enjoy some air conditioning, an ice cold beverage and our Brooklyn Buffet featuring a nacho bar, hot dogs, and more. Head to the park on Monday, July 7th when the Cyclones take on the Hudson Valley Renegades at 6:00 PM in a special doubl header. The first 1,500 single-game ticket field box ticket holders through the gate will receive one of these stars and stripes caps. It's also EVERYONE runs the bases day, so stick around after the game and don't let the kids have ALL the fun! Take Me Out to the Ballgame! Keep the holiday weekend fun going by catching some sun and foul balls at the Cyclones franchise-first weekend day game this Sunday, July 6th at 1:00 PM. Be sure to stick around after the game for Kids Run the Bases. It was a special Independence Day at MCU Park this year, for the second weekend in a row; Mets pitcher Dillon Gee made a rehab start with his former team, the Brooklyn Cyclones. This time, Gee was matched up against the Aberdeen IronBirds. Despite a strong effort from Cyclones pitchers, the Aberdeen bats got the best of reliever Josh Prevost, to tack on two late runs that would ultimately give them a 3-1 victory. Gee wasted no time on the mound in the first inning, only needing 12 pitches to get through the first three Aberdeen batters. After a failed bunt attempt from the leadoff hitter Jay Gonzalez, Gee mowed down the two remaining IronBirds batters. After Amed Rosario grounded into a double play, Jhoan Ureña who has been red-hot at the plate recently came up and hit a hard grounder into the gap between Aberdeen’s shortstop and third baseman to extend his streak to 12 games, which leads the New York-Penn League. Ureña would advance to third on a stolen base and error on the catcher, but after a walk from Michael Katz and line drive out by Michael Bernal, the Cyclones would head back onto the field without getting a run across. Gee’s positive momentum from the first inning carried over into the second inning, but only for one batter. After striking out the leadoff man, Gee would walk the next batter, fortunately for him he would be bailed out by his catcher Tomas Nido who had a nice throw to second to get the attempted base stealer. Unfortunately, during the same at-bat, Gee would give up a long fly ball to Jamill Moquete, who was driven in during the next at-bat by Federico Castagnini on a sharp line drive up the middle. In the bottom of the third, the IronBirds went to a new pitcher, righty Josh Walker. Brooklyn newcomer Will Fulmer was able to reach base by working a walk. After consecutive strikeouts, it seemed as if Fulmer’s walk would be for nothing, but the a line drive that hugged the left field foul line by Ureña would drive Fulmer all the way in from first to tie the game. In the top of the fourth, Gee found himself in a bit of a jam following a leadoff throwing error by Rosario that send the batter, Alex Murphy to second base. Gee was able to get a ground out for the first out of the inning and then utilized his curveball to strikeout the next two batters to get out of the inning unscathed. In the top of the fifth, Gee showed his major league talent, getting two first-pitch outs and then only needing three pitches to strike out Jay Gonzalez and end the inning. During the bottom half of the inning, Aberdeen switched things up, bringing in a southpaw, Bennett Parry in relief. Despite giving up a two-out base hit to Brooklyn center fielder Tucker Tharp, Parry would get out of the inning with ease. In his final inning of work, Gee struck out another two batters while also picking up a ground out, only needing another 11 pitches to get out of the inning. Through six full innings of work, Gee only allowed one run on three hits, striking out 10 batters. Following the strong start from Gee, Tom Gamboa called on the right-handed Seton Hall University product, and Big East Pitcher of the Year, Josh Prevost. Just as Gee did to start the game, Prevost breezed through his first inning of relief, getting a 1-2-3 inning. Despite a solid first inning, Prevost had a tough top of the eighth inning, giving up a leadoff double to Steve Wilkerson after Tharp was unable to make a diving play in shallow centerfield. Two batters later, Jay Gonzalez would chop a single over Rosario’s head to drive in the run. During the next at-bat, Gonzalez broke for second, and a poor throw by Nido would get away from Rosario trying to cover second, sending Gonzalez to third and setting up Oswill Lartiguez who would ground out and drive in the second run of the inning to give Aberdeen a 3-1 lead. With Prevost’s night over after two innings, Edioglis Villasmil entered the game to pitch the top of the ninth. After consecutive singles by Aberdeen, Jhoan Ureña was able to handle a hard hit ground ball, stepping on third and firing towards second to get a double play and take some weight off of Villasmil’s shoulders. The next at-bat, Ureña came through for Villasmil once more, catching a line drive to end the inning. Michael Katz led off the bottom of the ninth for Brooklyn and popped out in foul territory after hitting the ball softly off the end of the bat. Michael Bernal followed Katz, and was able to get on base with a single. After having a rough night at the plate, Gamboa pulled Tyler Moore and brought inJeff Diehl as a pinch hitter. On a 1-0 pitch, Diehl ripped a ball to left that would hit off the wall, getting in for a double. The hit by Diehl would bring up Tomas Nido with runners in scoring position and only one out. Unlike the last time he was in a similar situation, Nido would ground out, but also drive in a run. Unfortunately, the next hitter, Joe Tuschak, would fly out to left field after swinging at the first pitch, ending the Cyclones comeback hopes. On Sunday, the Cyclones will continue their series against the IronBirds, and it will be a special night at MCU Park, as the team will be hosting a “Salute to Seinfeld Night.” Limited tickets will be put on sale for Sunday’s game after 5 PM; all tickets put on sale will cost just $5. On Monday night, the Cyclones will have their first of consecutive doubleheaders against the Hudson Valley Renegades. Monday night will begin at 6:05 PM with a continuation of Wednesday night’s suspended game, followed by a seven-inning game. To purchase tickets for any Cyclones games, visit the box office at MCU Park, call 718-507-TIXX, or log onto BrooklynCyclones.com. On Saturday, July 5th we will celebrate 25 years of nothing as part of our "Salute to Seinfeld Night." The game is currently sold out, but we will be putting standing room only and any other remaining tickets, on sale at 5:00 PM exclusively at the MCU Park Box Office. 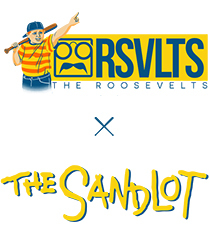 The Brooklyn Cyclones are teaming up with Exhilent Mobile for “Salute To Seinfeld Night” on Saturday, July 5th, 2014 to provide ScreenDuet, a second screen trivia experience for the fans at the ballpark. It's official, the Coney Island sky will be lit up with fireworks on Friday, July 4th as we celebrate Independence Day. The Nathan's Hot Dog Eating Contest, Cyclones baseball and a Fireworks show that you won't want to miss. And there's no better place to catch the Fireworks Spectacular than from the comfort of your own seat at MCU Park! Earlier today, the Mets announced that Dillon Gee will be making his third Major League Rehabilitation start with the Brooklyn Cyclones when they take on the Aberdeen IronBirds at MCU Park on Friday, July 4th. Gee, who was the Opening Day starter for the New York Mets earlier this season, began his career as a member of the Brooklyn Cyclones during the 2007 season. Cyclones thirdbaseman Jhoan Urena has been named the National Honey Board Player of the Week for the period ending June 29th. He currently has a 10-game hitting streak and is swinging the sweetest (get it, just like honey?) bat in the lineup. Everyone wants to be a part of the action at MCU Park...even the undead. On Wednesday, July 2nd MCU Park will host the first-ever Zombie Night at the ballpark in conjunction with our friends at NYC Zombie Crawl. Fans will be encouraged to dress in costume and participate in our Zombie Apocalypse at the Ballpark including a post-game zombie walk around the bases. On Tuesday, July 1st, the Brooklyn Cyclones will have a one-day-only sale on tickets for a number of games during the month of July, where field box tickets will be Buy One-Get One Free. First it was the Del Boca Brooklyn Rooftop. That sold out in six minutes. Next came the "Double Dip Your Chip" Suite Offer and that was gone faster than a speeding bullet (We had to make a Superman reference, this is a night about Seinfeld after all.) But we're not done yet. We have 100 tickets left in the main seating bowl that will go on sale Wednesday, June 18th at 10 AM as part of our "Free Soup for You" ticket offer. The Cyclones will take on the Staten Island Yankees on Sunday, June 29th for our first Family Sunday of the season. Show up early for a photo op with Cyclones mascots Pee Wee and Sandy and then stick around after the game for Kids Run the Bases. It's a fun filled day from start to finish! Join the Brooklyn Cyclones on Sunday, June 29th, 2014 for the 10th Annual Take Your Base Run/Walk on the famous Reigelmann Boardwalk in Coney Island. This year's event will raise money for the YMCA Scholarship Program. Head to MCU Park on Friday, June 27th when the Cyclones take on their cross-bridge rival Staten Island Yankees at 7:00 PM. The first 2,500 fans in attendance will receive one of these All-Star Game Visors courtesy of Pepsi. But that's not all, stick around after the game for our first Friday Night Fireworks show of the year and start your summer with a BANG! It has been three years since Jhoan Ureña's has seen him play, but Wednesday night was a special one for the two as they reunited in Brooklyn as Jhoan and the Cyclones took on Aberdeen. Jersday Thursdays are always some of our most popular nights of the season and this year will be no different. On Thursday, June 26th, the first 3,000 fans in attendance at our 7:00 PM game against the Aberdeen IronBirds will receive a Cyclones Soccer Jersey as we celebrate all things soccer in honor of the World Cup. Come on down to MCU Park on Wednesday, June 25th for the Price is Right Night. ALL TICKETS - from the first row to the last row - will be just $10. But that's not all, we'll have Plinco, we'll have a "Showcase Showdown," we'll have an entire night dedicated to one of the most successful game shows in television history. Plus, the first 2,500 fans in attendance will receive the first of our All-Star Cup Series giveaways. Outfielder Michael Bernal has been a shining star for the Brooklyn Cyclones so far this season. With great performances like his 4-for-5, 3 RBI game against Aberdeen on Friday night, he has been named the National Honey Board Player of the Week. Broadway musicals, $10 tickets, Jersday Thursday, Fireworks, Visor Giveaway and Kids Run the bases...sounds like a full week. The Cyclones return home to MCU Park on Monday to open a stretch of five home games this week. Here's a closer look at that's in store. They say the neon lights are bright...in Brooklyn? Well at least for one night they will be. When the Cyclones take on the Hudson Valley Renegades on Monday, June 23rd, MCU Park will be transformed into the Great White Way with performances from some of the best and brightest from around the area. On June 16th, the baseball world lost both a great player and a great man in Tony Gwynn. His untimely death sent a shockwave through all of baseball and particularly hit home with Cyclones manager Tom Gamboa who had the fortune of working with Gwynn in the Padres organization. The Cyclones will kick off their second series of the season on Tuesday, June 17th against the Hudson Valley Renegades. Stick around after the game for fireworks plus EVERYONE gets to run the bases. But that's not all, everyone's favorite beagle - Snoopy - will be on hand courtesy of MetLife. Honus Wagner, Shoeless Joe, Ty Cobb, Mickey Mantle, Ken Griffey, Jr and now, you? This season, the Brooklyn Cyclones are allowing fans to upload their own baseball card, share it via social media and in the end, one fan will have their own baseball card included in the 2014 Brooklyn Cyclones Team Set. Municipal Credit Union and the Brooklyn Cyclones will offer three Youth Baseball and Softball Clinics, free of charge, for boys and girls between the ages of 7 and 14. Children will receive instruction on the field at MCU Park from former big league star and MCU spokesperson John Franco. You never know what you'll see when you come to MCU Park, but on Monday's during the 2014 season that will truly be the case thanks to the all-new Magical Mondays. At every Monday Cyclones home game, our friends from Magic at Coney will be performing throughout the ballpark before and during the games. This Sunday, the Cyclones will be “on the road,” taking on the Staten Island Yankees in a doubleheader following Friday’s rainout. Also on Sunday, families across the country will be celebrating Father’s Day. But for one Cyclone, this one will be different than the many others he has experienced. Just last week, Josh Prevost had one of his dreams come true, being drafted in the MLB Draft. Unfortunately, he could not have his biggest fan at his side while watching his goal of becoming a professional baseball player become a reality. In January, Josh’s father, Bill Prevost passed away. Despite his early passing, Bill did not go out without a fight, he fought stage 4 colon cancer for three years. A native of Belle Mead, NJ, Prevost stayed in his home state and played college baseball for Seton Hall University. In 2013 during his junior season, his father would go watch his son as many times as he could, afterwards always giving words of encouragement, no matter the outcome. Prior to his death, Bill Prevost said on several occasions that his son was going to have a big senior year…boy was he right. When the season got underway in the spring, Josh did exactly what his father predicted. Prevost finished the season as the Big East’s most dominant pitcher, leading the conference in wins, ERA, opponent batting average, innings pitched, strikeouts, complete games, and shutouts. In fact, one of his complete games and shutouts came at his new home, MCU Park, when his Pirates took on St. John’s University in the Big East Tournament last month. Shortly after his final season, the Mets, his father’s favorite team, selected Josh in the 5th round of this years MLB draft. With his hometown just an hour away from Coney Island, Josh anticipates to see of his family throughout the season cheering him on at the ballpark. While the Cyclones have two games on Sunday afternoon, Josh plans on briefly seeing his brothers and being together to honor their father. Although Josh is now playing professional baseball, he is not done working hard. He will continue to keep his father in his thoughts and use him as inspiration as Josh continues his career. “I hope he’s proud and I’m gonna do everything I can to keep making him proud,” said Prevost. You want bobbleheads? We got 'em. You want jerseys? We got 'em. On Monday, June 16th the Cyclones will take on the rival Staten Island Yankees and the first 2,500 fans in attendance will get a choice of some of our favorite giveaways from the last few seasons. Casey Meisner will take the mound as the starting pitcher for the home opener against the Staten Island Yankees on Saturday night. The Mets drafted Meisner out of high school in the third round of the MLB Draft and he's raring to show Cyclones fans that the sky is the limit for this righthander. With the Cyclones Home Opener set for Saturday, June 14th against the Staten Island Yankees, here's a look at everything you want to know about the start of the 2014 season. When the Brooklyn Cyclones storm Richmond County Bank Ballpark on Friday for the first game of the 2014 season against the Staten Island Yankees, Octavio Acosta will be leading the Cyclones as he takes the mound. Another season of Brooklyn Cyclones baseball is upon us, and on June 10th, players arrived at MCU Park and caught a glimpse of their new home for the summer. Here's a preliminary look at who will be wearing a Cyclones uniform in 2014. The Cyclones will kick off their 2014 campaign against the rival Staten Island Yankees on Saturday, June 14th. Tickets are going quickly, but there are still a limited number of Field Box Seats that just became available. Get the family out of the house and down to the ballpark for a night of fun. Since the gates first opened in 2001, Brooklyn Cyclones games at MCU Park have always been fun events for the whole family to enjoy. 2014 will be no different as there are plenty of ways for families to enjoy the Cyclones experience at the ballpark. The fun begins right away on Saturday, June 14th as the Cyclones start their season with a game against their rivals, the Staten Island Yankees. Following the game, to kick off fireworks week, there will be a post-game fireworks show. There will be post-game fireworks show on Monday, June 16th, and Tuesday June 17th as well. The Cyclones and Yankees face off once again on Sunday, June 29th, which also happens to be the first Sunday Funday of the season. Every Sunday fans can take part in exciting experiences like running the bases, taking photos with players and mascots, and pre-game catches on the field. For fans that want to get more bang for their buck, they can purchase a Sunday Family Plan. Starting at just $20 per person, fans can purchase a plan that comes with a ticket, hot dog, soft drink, bag of chips, and a limited edition t-shirt. If parents want to enhance the Brooklyn Cyclones experience for their children, they can sign them up for the Cyclones Kids Club, the Tykeclones. For $20, young Cyclones fans become all-star members, receiving exclusive benefits like a ticket to every Sunday game, Tykeclones photo with the Cyclones, exclusive Sunday autograph sessions press conference takeover, early access to post-game kids run the bases, and plenty more. Sign up is as easy as logging onto brooklyncyclones.com. On Sunday, July 20th, the Cyclones will be calling all superheroes to the ballpark as they host Superhero Costume Day. Fans will be encouraged to dress as their favorite superheroes and show off their superpowers. The first 2,500 fans in attendance will also receive a free Superhero Lunch Box. When Brooklyn takes on the Vermont Lake Monsters on Saturday, July 26th, MCU Park will host a special guest to help celebrate WNET Family Day at the ballpark. Curious George will be making an appearance and will be available to interact with fans. It will also be Halloween In July at the ballpark as part of the Cyclones’ Holiday Week Celebration; fans will be encouraged to bust out their costume a few months early and take in the Halloween festivities. August 2nd is Star Wars night at the ballpark and those in attendance will feel the force that is Brooklyn baseball, as the Cyclones host the Connecticut Tigers. The first 2,500 fans will receive a Padawan Pee Wee Bobblehead and all fans in attendance will be able to enjoy a post-game fireworks show. The special guests will continue to roll into to MCU Park on August 4th for the Cyclones’ final game against the Tigers. The Muppets will be in attendance and all around the ballpark on this special Monday night. Returning to MCU Park on Saturday, August 23rd is princess night as the Cyclones wrap up the regular season. This is a time when everyone in the Cyclones organization, celebrates all of the princesses in our lives. The first 2,500 fans in attendance will also receive an Educator Sandy Bobblehead. Nothing says summertime like fireworks, and throw in some baseball and you have a night that EVERYONE can enjoy. The Cyclones will start the 2014 season with three-straight fireworks shows on Opening Day, Saturday, June 14th followed by Monday, June 16th vs. Staten Island and Tuesday, June 17th vs. Hudson Valley. On a day in our nation’s history that is forever connected to the sacrifices made by the members of our armed forces, the Cyclones have announced that they will partner with Rolling Thunder - NYC Chapters to have a Chair of Honor at MCU Park. The chair, which will be painted black and feature the POW / MIA emblem, will remain unoccupied in perpetuity in honor of the more than 80,000 American soldiers who have gone missing in action. It’s that time of year again, when Major League Baseball participates in the First Year Player Draft. This year’s draft will take place Thursday, June 5th through Saturday, June 7th. Starting Thursday at 7 PM ET, teams with first round picks will have the chance to choose amongst top talent. For the third straight year, the Houston Astros will have the number 1 overall pick, with the Miami Marlins and Chicago White Sox following. The general consensus among baseball experts is that the Mets will be looking to add another bat with their 10th overall pick. Many believe Oregon State’s Michael Conforto will be the man whose name is called on Thursday night when the Mets make their selection. The junior from Woodinville, Wash. will forego his senior year with the Beavers to play professional baseball. This season, Conforto’s squad had an impressive year, going 45-14 but failed to advance past the regionals round of the College World Series after losing two games to UC Irvine. Playing in all 59 of the Beavers’ games during the 2014 campaign, Conforto lead his team across the board with his play at the plate. Standing tall at 6-foot-2, the outfielder more known for his ability with a bat ranked second on his team with a .345 batting average, while leading his team in runs, hits, runs batted in, home runs, slugging percentage, walks, and on-base percentage. His patient approach at the plate not only allowed him to rack up 70 hits, but was also able to reach first on 55 walks, a 15-walk margin between him and the next best person on the team. Another prospect that could become part of the New York Mets organization is Brandley Zimmer, an outfielder who hails from La Jolla, Calif. and played college baseball for the University of San Francisco. Standing tall at 6-foot-5 Zimmer is a player with great athleticism and speed, which make him standout amongst other prospects. During the Dons’ 2014 season, Zimmer did not shy away from high expectations; similar to Conforto he led his team in a myriad of categories. With 21 stolen bases Zimmer found himself in the top 50 in steals, and with a .573 slugging percentage he landed in the top 60 in slugging, making him the player in the nation with this impressive combination. Many look at southpaw Sean Newcomb as a top-10 pick during this years draft. Coming out of the University of Hartford he possesses a great fastball that can reach the low to mid-90s. In 14 appearances during the 2014 season, Newcomb finished with an 8-2 record and a 1.25 ERA. Striking out 106 of 315 batters and only relinquishing 51 hits, opponents batted a measly .162 average against Newcomb. Newcomb has a great arm that many teams are looking at, and if he falls to the Mets at No. 10, he could find himself in the Mets organization. Former Cyclone players are shining all over the professsional baseball. See how some of your favorites are doing so far this season. So how badly do you want tickets for Seinfeld Night? The game sold out in less than a day, but for eight lucky fans we will be giving away tickets for free. But there's a catch...you've gotta paint your chest. But like David Puddy says -- you've gotta support the team. On Tuesday night, a group of nearly 1,000 Cyclones fans headed to Queens to root on the Mets during "Cyclones Night at Citi Field." Before the game, a limited number of season ticket holders were able to take photos and get autographs from former Cyclones Wilmer Flores and Juan Centeno. 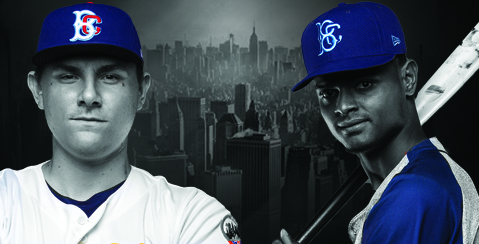 On Monday, June 16th the Cyclones will take on their cross-bridge rival Staten Island Yankees. The team will also celebrate the 50th Birthday of the Verrazano Bridge, and all things 50, when the teams square off at 7:00 PM. Xavier and Creighton will square off on Sunday afternoon at 1:00 PM in the Big East Championship's Final. Tickets are available and are just $15 for adults and $7 for kids 12 and under. The game can also be seen on Fox Sports 1. Can't wait to celebrate 25 years of nothing on Seinfeld Night? Want to get your hands on the Brooklyn Bridge or Shamrock Jersey? Can't wait to scoop up our Sunday Family T-Shirt Plans? Excited for the 1969 Gil Hodges Bobblehead? The list of one-of-a-kind giveaways goes on on and, and now you can get your hands on tickets for what is sure to be an amazing summer of Cyclones baseball at the MCU Park box office, by calling 718 - 507 - TIXX, or at BrooklynCyclones.com. Sunday is Funday at MCU Park with pre-game catches, autographs, pictures and more PLUS kids run the bases post-game. But that's not all. This year we've added a Pay One Price, Family Sunday Plan where for just $20 per person you get a ticket, limited-edition t-shirt, soft drink, hot dog and chips. It's a great way for families to enjoy a ballgame without breaking the bank. On July 5, 1989, the "Seinfeld Chronicles" aired on NBC for the first time and 25 years later, the Cyclones will celebrate the "show about nothing" that has left an indelible mark on popular culture. The first 2,500 fans in attendance will receive a Keith Hernandez "Magic Loogie" Bobblehead. In addition, there will be non-stop Seinfeld themed entertainment from beginning to end. Yada yada yada...you'll have an awesome night. Opening Day for the 2014 Brooklyn Cyclones isn’t until June 14th, but that doesn’t mean that there won’t be any baseball at MCU Park before the Home Opener. In fact, May is “Baseball Month” on Coney Island with nearly 50 games to be played at MCU Park even before the Cyclones throw their first pitch. Our Salute to Seinfeld Night on July 5th is going to be a night you don’t want to miss. Earlier this week our “These Pretzels are Making Me Thirsty” Package on the Del Boca Brooklyn rooftop sold out in less than two minutes. On May 10th we will put tickets on sale for individual ticket buyers and … yada yada yada… it’s going to be one of our biggest crowds of the season. We anticipate crowds arriving EXTREMELY early to ensure that they will be one of the lucky few who gets their hands on the “Magic Loogie” bobblehead giveaway that afternoon. But there is one more option available for those who want to guarantee they get their hands on the hottest giveaway item this summer. On a night when we are celebrating 25 years of “nothing” it’s only fitting that we had a cancellation in our Double Suite (Something about a sickness related to licking too many wedding invitations). But their loss, is your gain. We have put together a package so good that it will make you say “HEL-LLOOOOOOOOO” and come on down to MCU Park. A GUARANTEED Magic Loogie Bobblehead for everyone in your group. 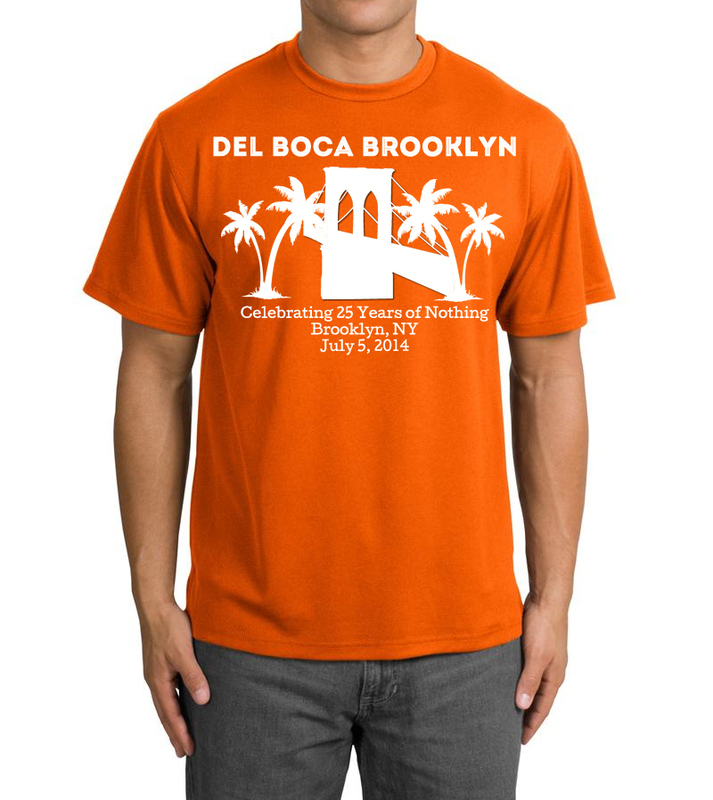 A limited-edition Del Boca Brooklyn T-Shirt. Brooklyn Cyclones Cap for everyone in your group. Field Box tickets for another Cyclones game during the 2014 season. One person from your group will automatically be able to participate in our Elaine Dancing competition post-game. If these pretzels are making you thirsty, we’ll include beer, soda and water to quench your thirst. Traditional ballpark food including hamburgers, hot dogs, chips and dip, cookies (no, not black and white cookies), fruit salad, and pasta salad. 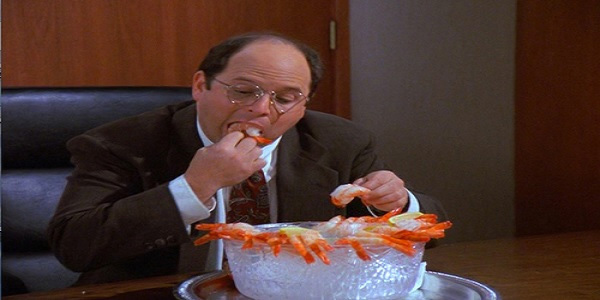 In honor of George “T-Bone” Costanza, we’ll add grilled steak and shrimp cocktail as well. It’s a great deal, for a great night, and it’s going to go quickly because there is only suite left in the ballpark for the evening. It’s available to the first group that puts down the 25% deposit, so call us now at 718-382-2604 and reserve the La La La Lounge for your group. Baseball is more than just a game. It's a way to make learning fun for children. On May 14th, the Cyclones will host their 2nd Annual Education Through Baseball Day, where kids can learn about science, math and english. This year, they can also see living history with an exhibition explaining the evolution of baseball from the Brooklyn Atlantics Base Ball Club. Live in the lap of luxury...at least for a night...with a Luxury Suite rental at MCU Park. A group of any size from 12 - 36 can live it up at MCU Park for a cost as low as $675 for the night. Every game at MCU Park is filled with fun from the start to finish. But on Sundays, we add a special twist with the amazingly talented and unbelievably enthusiastic Pee Wee's Dance Crew. This group of boys and girls between the ages of 8-12 perform in front of thousands at various games throughout the summer. Auditions will be held on Saturday, May 3rd at MCU Park with registration starting at 10 AM. Can’t wait to be part of our Seinfeld 25th Anniversary Party on July 5th? Well now you don’t have to! Starting Monday, at 10 AM, fans will be able to purchase our “These Pretzels are Making Me Thirsty” Package including tickets on the Del Boca Brooklyn Rooftop for the July 5th game. If you haven't renewed your full-season or partial season package for the 2014 season yet, we would like to remind you that in order to receive your personalized ticket book - rather than single game ticket stock - you must renew your tickets by Friday, April 18th. For season ticket holders, you must also renew your plan by that date to receive tickets to Brooklyn Cyclones Night at Citi Field on May 27th. MCU Park, which has been the home of the Brooklyn Cyclones since 2001, will have a new home team starting on April 13th when the New York Empire, a professional Ultimate Frisbee team and member of the AUDL, start their 2014 campaign against the Toronto Rush. This will mark the first of three home games played at MCU Park for the Empire. The Cyclones have completely revamped their kids club and are proud to introduce the all-new Tykeclones for the 2014 season. This group offers unparalleled access to Cyclones players, exclusive events, tickets to every Sunday home game and more. 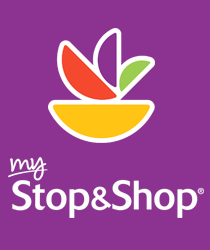 Check it out and join the club! Spring is finally here, and that means baseball season can’t be far behind. After the winter we’ve had, little leaguers throughout the city are chomping at the bit to get back on the field and throw baseballs instead of snow balls. With that in mind, the Brooklyn Cyclones have introduced the all-new “Little Kids, Big Stars” Program to highlight the best and brightest in youth baseball and softball from the five boroughs and Long Island. MCU Park has been called "The Most Fun Ballpark in America" and the Brooklyn Cyclones Beach Bums are a key factor in making the ballpark come to life. The Cyclones are looking for dancers who would like to perform in front of thousands every night, while also joining the team for promotional and community out reach. Auditions will be held on Saturday, April 12th at 10:00 AM. How easy is it to find eight games that you could include in a “Domino’s Slice of the Season Flex Plan”? We had eight front office members pick one game that they are excited about this summer. We call it the Front Office Flex Plan. To get your five or eight game plan, call 718-37-BKLYN. Angelina: Brooklyn The Musical – June 23rd vs. Hudson Valley - There’s no need to stand in line at TKTS in Time Square to score tickets for this show! Brooklyn the Musical Night will transport the bright lights of Broadway to Coney Island for a spectacular “One-Night-Only” event. This night is sure to have the Newsies singing all about how Wicked our Jersey Boys – err, I mean Brooklyn Boys – are playing! With performances by local talent from your favorite Broadway shows and 3 acts (or 9 innings) of baseball, who could ask for a better show? No need to get off the train at 42nd St. Stay on the Subway all the way to the end of the line at Coney Island and enjoy the neon lights of MCU Park! Craig: The 2nd Annual Intern Games- August 13th vs. Lowell - Last year we did the first ever intern Hunger games here at MCU Park and it was a huge success. We had five interns representing the five “districts” of the stadium (bleachers, first base side, home plate, third base side and suite levels). Then each competed to be crowned “Intern Game Champion” and to win a private promo item toss for their district. Each district was assigned a color which fans in that section were encouraged to wear. We had three contests (how fast can you pull all of the tissues out of the tissue box, a dizzy bat race and a scavenger hunt using only items collected from fans in your district) to eliminate three of the five competitors. The last two interns squared off in the final showdown (an obstacle course starting from the right field flagpole, on tricycles, around the bases, avoiding tables and cones along the way and then a foot face while harnessed into a parachute, to home plate). Word around the office is that John -- The Champion from the bleacher district (who won on a headfirst dive into home plate) - will be back to defend his crown. So pick your district, wear your color and get ready to cheer, this will be an amazing night and …oh yeah there is also a baseball game. Jared: Star Wars Night - August 2nd vs. Connecticut - Star Wars Night would be a great night to add to your 8 game flex plan. We will be having some great performances throughout the game as well as star wars themed jerseys. In addition there will be a Star Wars themed bubblehead giveaway. Did a mention Saturday Night fireworks as well? Fans can come and celebrated the theme by dressing up as their favorite star wars character. It’s a really cool night and a great game to be a part of and experience. Billy: Seinfeld Night – July 5th vs. Aberdeen - For a show “about nothing,” Seinfeld has certainly left its mark on American pop culture over the years. On July 5th, we will celebrate the 25th Anniversary of the first episode of Seinfeld (Little known fact, it first aired under the title - “The Seinfeld Chronicles”) hitting the airwaves. As a person who has seen every episode of Seinfeld at least 20 times each, this may be my favorite night at the ballpark ever because the options for entertainment are nearly endless. We can turn Customer Service into “The Airing of Grievances”, we can hold an Elaine Dancing contest, mailmen in uniform get to throw out a first pitch, a closest to the hole challenge in honor of Kramer and the whale, the foul polls become Festivus polls, a guy strikes out and we play “No soup for you”, give away pencils that are chewed by either Steve Cohen (Cyclones VP) or Stephen Cohen (this guy I play softball with), the players in puffy shirts, cereal eating contests, change the name of the field to “Vandelay Industries Park” and all latex salesman will get a free ticket, games of RISK on the concourse…the options are too many to list. But my favorite part of the night? I could get in trouble for letting the cat out of the bag but…(in my whisper voice) we’re going to do a Keith Hernandez bobble head that night. But not one of him as the gold glove first baseman…that wouldn’t make sense on Seinfeld night. We’re going to do a Keith Hernandez bobble head , where he looks in the episode when he describes “The Magic Loogie” that hit Kramer and Newman. Yadda yadda yadda, it’s going to be awesome. Bret: Zombie Night –July 2nd vs. Hudson Valley Renegades – For a Wednesday night in the beginning of July why not pretend its Halloween and come get dressed up as a ZOMBIE for the night. We are working with the NYC ZOMBIE CRAWL committee who do all the zombie walks throughout New York. Since this date falls two days before the annual Nathans Hot Dog competition we are also planning a Zombie “brain” eating competition prior to the start of the game. People will be coming out to the game in costume as zombies. How great will it be seeing hundreds of zombies heckling and scaring the Cyclones opponent that night? Josh H: Opening Day – June 14th vs. Staten Island Yankees - 20th century painter, Pablo Picasso, once said that “art washes away from the soul the dust of everyday life” and that’s kind of how I like to think of opening day here at MCU park. All of the frustration from winter, frustration from work, frustration from living in the most expensive city in the world gets forgotten with the opening of not only a new Cyclones season but also an opening of all new possibilities in Coney Island. Opening day for me is the unveiling of a new summer canvas that together as fans of the team will be painted through the course of 38 summer nights possibilities…Ok so while art isn’t for everyone, you can at least see fireworks after the game which is always pretty fun to see. Madison: Princess Night – August 23rd vs. Tri City – Calling all Cyclone Royalty, you are cordially invited to Princess Night at MCU Castle! If you're a fan of playing dress up, glitz, and all things pink (or your daughter is) then this is the night for you. Every Princess in attendance will receive their own sparkly tiara and a FREE makeover by the Glitzy Chicks, who will be glitzifying the Kids Zone. Make sure to wear your best dress if you want to march in the Princess Parade led by Prince Charming and a surpise Princess (dont know who theyre sending this year) Your Fairy Tale Night will conclude with post-game Fireworks, music and dancing on the field with your princess which is truly a magical moment. Besides what goes better than baseball and princesses? Nicole: The Price is Right Night- June 25th vs. Aberdeen: Come on down for The Price is Right Night at MCU Park! Premiering in 1972, The Price is Right is the longest running game show on television. With 42 years of material and over 80 different games to pull from, The Price is Right Night promises to be one of the most exciting nights at MCU Park this summer. It just so happens this night falls on a Wacky Wednesday so for only $10 you can come participate in what I believe to be some of the greatest games on television. How can you not come with the price being SO right! From name tags at the front gate to Plinko on the concourse, this night is sure to be filled with one of a kind cliff hangers. Not everyone can make the trip to California but I assure you everyone can make the trip down to Coney Island. So come on down, and maybe at the end of the night we can even help get your pets spayed and neutered! For the first time in franchise history, every Opening Day starting pitcher at every level of the Mets organization is a former Brooklyn Cyclone. From Dillon Gee at Citi Field on down to 2013 Brooklyn Cyclones Sterling Award Winner Rob Gsellman at Savannah, every opening day hurler is a Cyclones alum. Check it out here to see where your other favorite Cyclones from the past are Opening the 2014 season. While some players take vacations or spend time with their families during the off season, Brandon Nimmo was training with National League MVP Andrew McCutchen, All-Star third baseman Pedro Alvarez and soon-to-be first round NFL Selection Teddy Bridgwater at the IMG Academy in hopes of taking a big step towards achieving his Major League goal during the 2014 season. The Brooklyn Rooftop offers an unparalleled setting for your summer party. From atop MCU Park, you and your guests have access to unobstructed panoramic views of the Atlantic Ocean, the lights of the Coney Island Amusements and even the Manhattan Skyline in the distance. Enjoy the million dollar view without breaking the bank. Kids love to be the center of attention, and at MCU Park we guarantee that they will receive the red carpet treatment that comes along with our special Birthday Party Packages. Tickets start at just $18 and include food, beverage, party favors, invitations and more. Celebrate your child's birthday party without the stress. Just sit back, relax, and watch your son or daughter have the time of their life! There are few people who are more beloved in the borough of Brooklyn than the great Gil Hodges. Friday, April 4th would have been the former Brooklyn Dodger first baseman and New York Mets manager's 90th birthday. To celebrate this occasion, we are offering a special "Happy Birthday Gil" ticket offer featuring two tickets and a limited edition t-shirt for just $32. You've waited long enough. 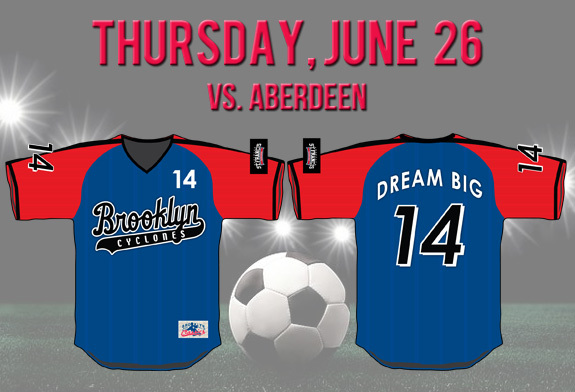 So without further ado, we are happy to unveil our Jersday Thursday designs for the 2014 season. 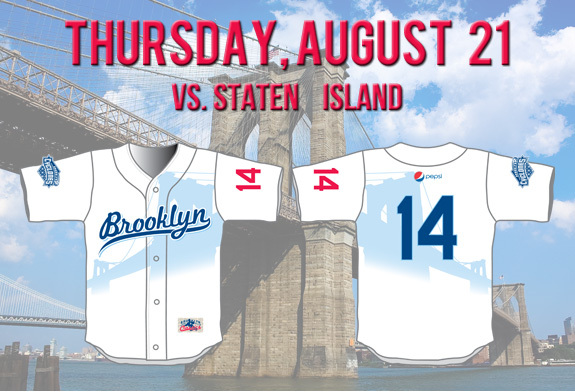 This year we've added a soccer jersey as we celebrate the World Cup, a Gil Hodges Jersey (the only #14 that matters), and more to our ever-popular season-long series of giveaways to the first 3,000 fans in attendance at every Thursday game. Single game tickets for the 2014 season aren't on sale yet, but you can get your tickets for these games and more by purchasing full-season tickets or partial season plans for the 2014 campaign. In 2004, Dante Brinkley was an offensive force for the Cyclones, batting .316 with six home runs, 30 RBI and 14 stolen bases. After the season, the 23rd round pick from Southwest Missouri State was named a New York-Penn League All-Star. Now he works at Northwestern University and started his own recreational sports league. V.I.P. Partial Season Plans are a great way for you to experience the fun and excitement of Cyclones baseball without the commitment of a full, 38-game season package. This year, there are six, five-game plans that can fit anyone's schedule, starting at just $75. We also have the eight-game Domino's Slice of the Season Plan which allows you to pick your own games. Can't wait to get your tickets for Opening Day? Now you don't have to. With the Dublin Double Play, you can purchase Field Box tickets for Opening Day (June 14th) and Irish Heritage Night (July 31st) for $32, and get a limited-edition Brooklyn Irish T-Shirt for free. The offer is valid online only and will be available for a limited time starting Friday, March 14th at 10 AM. In 2003, Brian Bannister was a post-season all-star for the Cyclones after going 4-1 with a 2.15 ERA. In 2006, he became the first Cyclone to pitch for the Mets. Now? He's a father of two who has begun an entirely different career with a film studio in Phoenix. The coaching staff for the 2014 Brooklyn Cyclones has been announced and will feature all-new faces for the first time since 2011. Tom Gamboa, who has over four decades of experience in professional baseball, will serve as the manager, while Tom Signore joins the team as the pitching coach. Benny Distefano, who served as the Cyclones hitting coach in 2010, will return to the team in the same role for the 2014 campaign. Aramark at MCU Park is looking for Non-Profit Organizations (NPO’s) who would be interested in raising funds by working in our Concession Stands for a percentage of the sales. If you have 501(c) status or can become 501(c) registered, you are eligible to join us. MCU Park has been the home field for the Brooklyn Cyclones since its opening in 2001. Over 100 big leaguers, including the likes of David Wright, Jose Bautista, Josh Hamilton and Robinson Cano have taken their cuts on the field and now it's your turn. The Cyclones are offering special pricing for Little Leagues and High Schools who want to make our home field, their home field! Why sell magazine subscriptions, wrapping paper or other boring tchotchke's for your child's school, when you could be selling "The Most Fun Ballpark" in all of Minor League Baseball? With Cyclones FUNdraising, schools sell Cyclones tickets, get to participate in an in-school assembly featuring King Henry, all culminating with a night at the ballpark while raising money for school programs. We've had 48 inches of snow this winter, so we thought everyone could use a taste of summer. Take advantage of our "Fuhgeddaboud the Snow" ticket offer for our first-ever weekend day game on July 6th. We promise it won't snow, and the only things that will be ice cold are the beers. For a limited time, box seats to this game will cost just $4.80. Over the last few months you may have seen some reports in which Brooklyn has been highlighted as being the second most expensive place to live in the United States. Well while the real-estate market has hit an all-time high, there is still some prime oceanfront property on Surf Avenue that's going for a bargain! Group tickets for the annual Irish Heritage Night at MCU Park are on sale now. Be sure to purchase your tickets early, as this is always one of the most popular nights of the season. The first 3,000 fans in attendance will once again receive a green and gold St. Patrick's Day Jersey courtesy of Budweiser. On Friday, June 27th the Cyclones will hold their annual Girl Scout Sleepover following the 7:00 PM contest with the Staten Island Yankees. Girl Scout troops will receive a game ticket, Cyclones cap, commemorative patch and will also have access to the sleepover and pre-game parade for just $16 per person. A trip to see the Cyclones has always been a great way to spend time with family or reunite with friends. This year, the team has created special group packages for Alumni Associations looking to bring together classmates and remininisce about their times on campus. Group Outings to MCU Park are always a great way to spend a summer night. But we've seen some groups who have thought outside the box to make their ordinary trip to see the Cyclones an extraordinary night that will never be forgotten. Here's a quick run down of five of the most successful ways to spice up your group outing. The Brooklyn Cyclones and the New York-Penn League have announced that the 10th Annual NYPL All-Star Game will be coming to Coney Island during the Summer of 2014. MCU Park, which hosted the first-ever New York-Penn League All-Star Game in 2005, will once again welcome the best the league has to offer on Tuesday, August 19th. As we close in on the start of a new baseball season, BrooklynCyclones.com will periodically catch up with some of your favorite players from years past to check in and see what's new. This week, we spoke to Jared King from the 2013 Cyclones. Jared, who was a 5th round selection in the 2013 MLB Draft, hit .314 (32-102) in 30 games at MCU Park this season. The teams are set, now it's time to start planning your Super Bowl Party and the Cyclones want to help. Anyone who purchases Cyclones Season Tickets or Partial Season Plans will be entered into a drawing to win a catered party for 25 people courtesy of Pig Guy NYC. MCU Park is the perfect setting for more than just baseball games. Our home has been the setting for corporate parties and meetings, networking events, company team building, charity events, graduations, and more. To find out pricing and availability, please call 718-37-BKLYN. MCU Park is the perfect setting to enjoy a Summer evening with your friends, family or coworkers. Plus, with all the discounts and additional perks for the 2014 season, there has never been a better time to bring your group to "The Most Fun Ballpark" in all of Minor League Baseball. While next season may seem like it’s still a long time from now, Opening Day will be here before you know it. The 2014 season will start earlier than ever before, with our Home Opener set for Saturday, June 14th against the Staten Island Yankees. While that night is sure to be one of the highlights of the season, we are happy to announce that the biggest celebration of the 2014 campaign will come on Tuesday, August 19th when MCU Park hosts the 10th Annual New York-Penn League All-Star Game. This marks the first time since 2005 that the ASG will be in Brooklyn and will be the culmination of a year-long celebration of the 75th Anniversary of the New York-Penn League. NEW CYCLONES SEASON TICKET ID CARDS: You are our most valued patrons. You make the commitment to come to MCU Park every night, and we want a way to help you stand out from the crowd. Season Ticket Holder ID Cards will entitle you to special red carpet treatment and special offers all season long. NEW CYCLONES FAST PASS: Nobody likes to wait, and now you won’t have to. We will have special “Season Ticket Holder Only” lines for Everyone Runs the Bases, Kids Run the Bases, and Autographs on the Field. NEW IRONFAN AWARDS: Nobody is more dedicated to Cyclones baseball than our Season Ticket Holders. With the new IronFan Awards, we will recognize those who come to at least 90 percent of our games and give them a chance to enjoy a game from the comfort and luxury of one our exclusive suites during the 2015 season. NEW TEAM MEETINGS: Prior to select games during the 2014 season, you will be invited to attend special team meetings with Cyclones players, coaches and front office members. Ask questions, voice concerns, or just get to know the members of your favorite team a little bit better. NEW SCOREBOARD MESSAGE: Celebrate a special birthday, wish a happy anniversary to your spouse, or just pass along a welcome to a special guest. Every Season Ticket Holder will have the chance to share their special message on our video board free of charge. NEW ON FIELD ACCESS FOR ALL-STAR GAME: Experience the All-Star Game like nobody else, with special on-field access prior to the 2014 ASG. SEASON TICKET HOLDER BBQ & SEASON TICKET HOLDER BP: This year we have split the event in two. Head to the ballpark early one Sunday for a chance to mingle with the Cyclones during a BBQ, and then come back on a non-game day to take some cuts during Season Ticket Holder Batting Practice. EVEN MORE FREE PARKING: We’ve adjusted our parking policy from years past to give you the ability to park for free at even more games by adding Sunday’s to the available dates. For every ticket in your season plan, you will receive eight undated vouchers that can be redeemed for free parking in the lot adjacent to MCU Park. These vouchers are for any game Sunday - Friday (excluding July 4th) based on availability. NEVER WASTE A SEAT WITH NO BLACKOUT DATES: We know that sometimes life gets in the way of our plans. Sometimes you have car trouble, or your kids get sick, or maybe you get stuck at work later than you would have wanted. But that doesn’t mean your tickets have to go to waste. After the games has been played, you can redeem your unused tickets for ANY GAME during the 2014 Brooklyn Cyclones regular season. LOADED TICKETS: For every ticket in your season ticket plan, you will receive 10 undated vouchers with a $6 credit towards food, beverage or merchandise at MCU Park. Use the credit for ANYTHING in the ballpark. The choices are endless and completely up to you. VALUE PRICING: You get the best seats in the ballpark for less money…it’s that simple. Your Field Box Seat will cost just $14 per game. That’s a savings of over $150 per seat compared to our game day price. SEASON TICKET HOLDER NIGHT AT CITI FIELD: You have seen former Cyclones like Bobby Parnell, Ike Davis, Dillon Gee, Daniel Murphy and others star in Brooklyn, now here’s your chance to see them take the field in Queens. Season tickets holders will receive a complimentary ticket to Cyclones Night at Citi Field (One ticket per seat on account). As an added bonus, the first 100 people who pay in full will be invited to a special meet-and-greet with former Cyclones who now call Citi Field home, prior to that evening’s game. FREE PLAYOFF TICKETS: Nothing beats the excitement of playoff baseball…actually nothing beats the excitement of playoff baseball FOR FREE. STH EARLY ENTRY: Beat the crowds and ensure that you get that giveaway item you’ve had your eye on. FLEXIBLE PAYMENT OPTIONS: We understand that you may need to be work out a payment plan of smaller installments that works for you. Just ask us, we are here to help. We are happy to say that your per-game Season Ticket price will not change this season, which means that all 38 Cyclones games and the All-Star Game will cost you $545. That means that for just $14 a game, thanks to all the benefits above, you’ll get over $500 of savings and extras while enjoying the great baseball, sneak peeks at future stars, unforgettable entertainment plus all of the Jersday Thursday and weekend fireworks shows that makes the Brooklyn Cyclones the most fun – and the best deal – in town! To renew your tickets, or if you have any questions, please call us at 718 – 37 - BKLYN. Anyone who pays in full by December 15th will have the chance to throw out a ceremonial first pitch before a 2014 Cyclones game (One per account). New this season are Brooklyn Cyclones Flex Books, which offer a unique way to experience Cyclones baseball. These undated ticket vouchers entitle you to a Field Box Seat for any game of your choosing, with no restrictions. The vouchers come in sets of six and can be used all at once, or spread out throughout the season. The options are up to you, and as flexible as your own schedule allows. These vouchers come with a savings of nearly $20 as compared to day-of-game pricing, and can be redeemed in person at the MCU Park Box Office. To purchase your Flex Book vouchers for just $90, call us at 718-37-BKLYN.